FREE Zone File Research is available! With an intention to cover all Domaining tools that are required popularly and frequently, we have launched Zone File Analyzer tool with cool options and it’s completely FREE! The main purpose of zone file research is to find similar domains that might uncover potential end-users or check the value of words combination by looking into the number of similar registered domains of the entry words. Until now this job can be done by several services such as Zfbot.com, so what’s new? Well, here in TopNames we believe that a tool cannot be really useful unless it fulfills the required job perfectly. Now you can crawl the results using Domain Crawler tool with a single click and limit does not apply to queries! You get up to 500 domains and can check which one is developed and go through it instantly. This entry was posted in TopNames Service Review by Mohammed. Bookmark the permalink. Service demo for the new visitors! 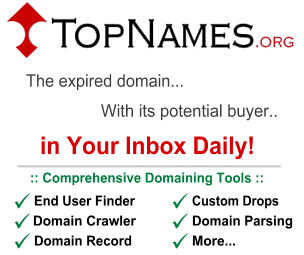 TopNames Features & Tools Review! Copyright © 2019 TopNames Blog . All Rights Reserved.